MHS-Elektronik (Germany) offers an embedded CAN-USB adapter. The cost of the matchbox-sized module is 50 € when ordered in a pack of 10 (60 € unit price). 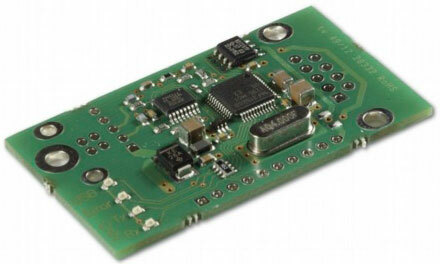 THE MODULE IS POWERED BY A CYPRESS 16-bit micro-controller with a CAN interface which is not galvanically isolated. The added FTDI USB chip provides support for operating systems on the USB bus. The module supports the Silent Mode and is also able to confirm the transmittance of CAN messages. The features of this module cannot quite keep up with its big Tiny-CAN brothers, though the low usage of energy and its size make the module suitable for the Raspberry Pi. The Tiny-CAN I-XL module is already in use with a multitude of embedded applications with Linux and Windows. It was the next logical step to offer the hardware as an embedded version without USB and Sub-D-Connector. Developers are provided with a free development package including a multitude of program examples for the languages C/C++, C#, Visual Basic, Delphi, Python, and Labview under the operating systems Microsoft Windows, Apple OS X, and Linux. A CAN-Trace can be run by the graphic open Source tool Tiny-Can Monitor of the company. The filtering feature facilitates the analysis of CAN networks. The macro function helps with sending CAN messages. It is also possible to send messages periodically. The open source tool has been developed using GTK+ for Microsoft Windows, Linux, and the Raspberry Pi. CANopen, J1939, OBD, and more are being covered by free and commercial third-party-tools. For embedded applications which need an EIA-232 interface or more flexibility, the company alternatively provides the modules Tiny-CAN M2 and M232. For more than 15 years, the company MHS-Elektronik in Koesslarn (Germany) near Passau has constantly been developing CAN solutions. Their CAN adapters are running in the third generation now and offer reliability for operating in the embedded world.